The rain was torrential, branches were being whipped across the motorway and several houses lost their roofs. It was shear Madness to be even thinking about sailing let alone viewing one with intent to buy. Shear Madness was the name of this Oyster 56 we had come to view. She was built in 1998 for Richard Mathews, founder and chairman of Oyster yachts. He raced her successfully in the ARC as well as Antigua week before sailing her across to New Zealand in time for America’s cup in 2001. 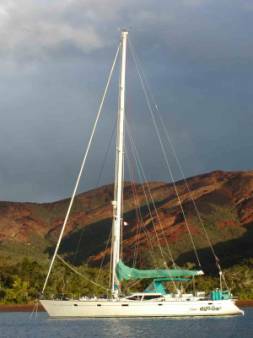 With Mathews racing background she was built to be particularly fast so has a fully battened mainsail, carbon mast and rod rigging. She was then sold to an American couple who had fallen in love with her at the Annapolis boat show. 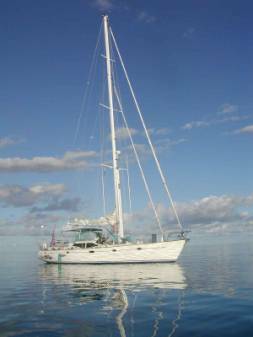 Bradley and Cathy owned her for 7 years and cruised New Zealand and Tasmania as well as the islands. 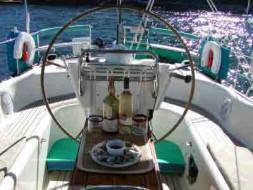 We have been looking for a new bigger boat and have always thought that an oyster would be the dream yacht. How lucky are we to have found what we think will be the perfect boat on which to cruise in comfort with family and friends. This is a lot of boat for the two of us to handle but she has all the electric winches that are needed to handle the sails. We return to the UK in September for a couple of months and then we will return to New Zealand, settle in and become familiar with our new Duet. After Christmas in the Bay of Islands we will head south and intend to circumnavigate New Zealand which will be a not only a great cruise but also a perfect way to get to know the boat.